Remember how at the Season 8 "American Idol" finale, Ryan Seacrest described the Kris Allen/Adam Lambert showdown as "the guy-next-door vs. the guyliner"? Well, Adam is apparently a more complex man than Ryan gave him credit for. In Adam's new video for "Better Than I Know Myself," Adam takes on both roles--the light and the dark, the innocent and, as Britney Spears might say, the not-that-innocent--and the result is the most compelling music video Adam has ever done. Clearly, two Adams are better than one. 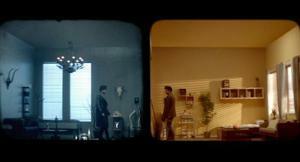 The stunningly art-directed clip depicts the two faces of Adam in a face-off of wills, and the split-personality effect is fascinating indeed. On one side of a two-way-mirrored wall we have Evil Adam, who looks like he just zombie-walked off the set of a classic Marilyn Manson video. Evil Adam drinks too much, wears too much makeup, throws too many rock-star tantrums, and dresses in a LOT of leather. This is probably the Adam the general public knows better, or thinks they know--the Adam whose antics and outfits get splashed all over the tabloids and blogs. And then, on the other side of that wall, in a lushly earth-toned, apparently hermetically sealed room that looks pulled from the pages of a pristine Pottery Barn catalog, there's Good Adam. Good Adam prefers herbal tea over vodka, meditation over partying, Ivory soap over spackled-on MAC, light over dark, and cozy Mr. Rogers cardigans over sharp-shouldered Hellraiser trenchcoats. This is the Adam that most of us never see, but as the video unfolds, we start to get the impression that the domesticated Good Adam persona is actually a more accurate representation of the man in real life...and that the Evil Adam character is just that: a character. Maybe we don't know the true Adam Lambert at all. 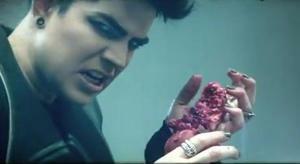 "I think people just like to write someone like me off, like, 'Oh, he's a freak,'" Adam recently told me in an interview about his upcoming album, Trespassing--and honestly, yes, it IS awesome to see Evil Adam freak out here, crushing a bloody heart (or is that just a pomegranate?) in his fist and pouring booze down his throat and rocking a pair of fierce feline contact lenses. Evil Adam is fun! However, Adam also told me, "But I'm a person. It's not that one-dimensional." 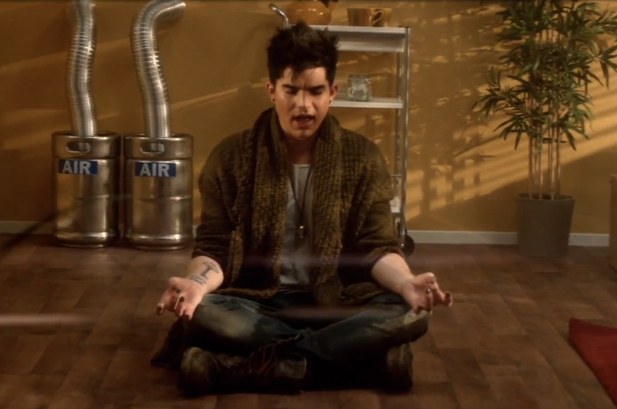 So it's nice to see another dimension to Adam here. Trespassing promises to showcase both sides of Adam's light/dark personality, so this video is a perfect embodiment of the album's message. And did I mention both Adams look gorgeous? See Adam's two sides collide below!